According to the inspector-general, McCabe "lacked candor" in conversations with FBI officials about role in media reports. "We therefore concluded that McCabe’s disclosure of the existence of an ongoing investigation in this manner violated the FBI’s and the Department’s media policy and constituted misconduct," the report said. Earlier in the day, US President Donald Trump lashed out at former FBI director James Comey, whom he fired in May 2017. Comey led an investigation into Trump’s alleged collusion with the Russian government to influence the outcome of the 2016 presidential election. 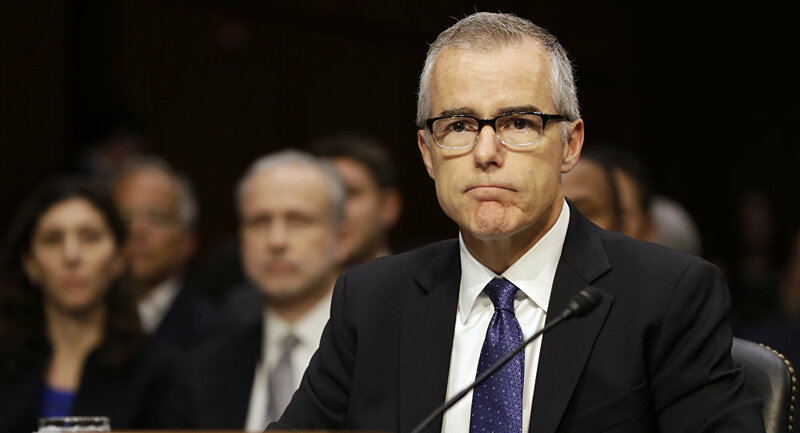 McCabe was the right-hand of Comey, and after the latter's dismissal, McCabe served as head of the FBI until the approval of the new director, Christopher Wray. He was also among the contenders for the post of the department's head. In March, US Attorney General Jeff Sessions fired McCabe, shortly before he was set to retire, saying that the FBI official had not been forthcoming enough during an internal review of the FBI inquiry into Clinton Foundation. McCabe fought back, saying that his firing was part of the US administration's efforts to discredit the FBI and the probe into alleged Russia collusion. US President Donald Trump called the firing of McCabe a "great day for democracy" after he had repeatedly slammed the FBI for being corrupt.